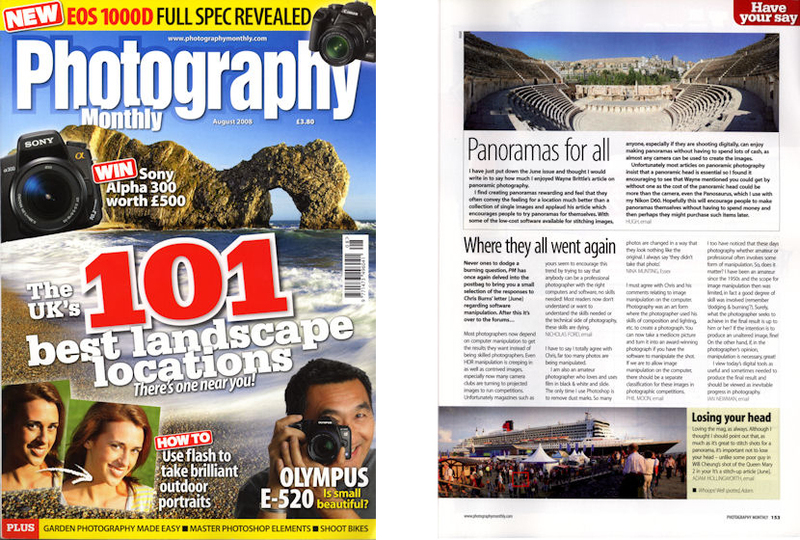 The June 2008 copy of Photography Monthly carried an article by Wayne Brittle on the subject of taking panoramic photographs. I found Wayne’s article particularly interesting because he did not follow the normal pattern of suggesting that a Panoramic Head was essential, which often discourages people from trying panoramic photography for themselves. I find creating panoramas rewarding and feel that they often convey the feeling for a location much better than a collection of single images and responding to Wayne’s article by writing to Photography Monthly. My comments were printed on Page 153 of the August 2008 copy together with my panorama of the Roman Amphitheatre in Amman, Jordan. I have just put down the June issue and thought I would write in to say how much I enjoyed Wayne Brittle’s article on panoramic photography. I find creating panoramas rewarding and feel that they often convey the feeling for a location much better than a collection of single images and applaud his article which helps towards encouraging people to try panoramas for themselves. With some of the low cost software available for stitching images anyone, especially if they are shooting digitally, can enjoy making panoramas without having to spend lots of cash, as almost any camera can be used to create the images. Unfortunately most articles on panoramic photography insist that a panoramic head is essential so I found it encouraging to see that Wayne mentioned that you could get by without one as the cost of the panoramic head could be more than the camera, even the Panasaurus, which I use with my Nikon D60. Hopefully this will encourage people to make panoramas themselves without having to spend money and then perhaps they might purchase such items later. Links include PanoramaStudio, PTGui, Pano2VR, Red Door VR, panoramic tripod head suppliers and 360° panoramas.